The entrance enhanced by woodwork, and its doors Art nouveau. The raised patio, shielded from the wind and the sun of the afternoon is a cool and restful place. The entrance enhanced with woodwork, opened on the patio. 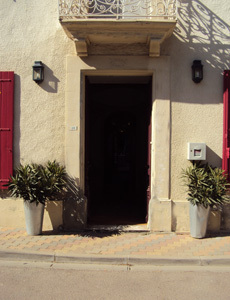 Imagine a time witness in the heart of the Haut Minervois, between mountains and sea. Here, gastronomy, heritage, vine, nature combine to make this home a relay, a unique holiday cottage. At the heart of the village, this 19th century maison de maître of a wine merchant is welcoming, populated by artist mind. We have preserved many original features, adding modern comfort. Our desire is that you feel at ease. Cool in summer, warm in winter, our home will be your base for exploring this fabulous area. Our patio and terrace will allow you to relax in a cool and calm tree-shadded place .